What exactly is a cloche and what is it’s origin? 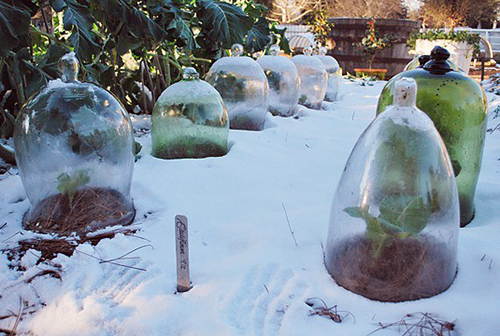 Cloches are transparent bell-shaped domes used to cover plants outdoors to protect them from frost. This was their original purpose but today they are also used extensively in home decor. 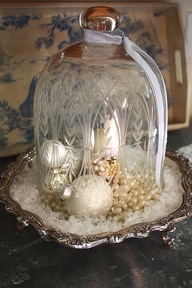 Since my purpose is to write about a NEW use for something OLD, let’s take a look at some of these decorative cloches. 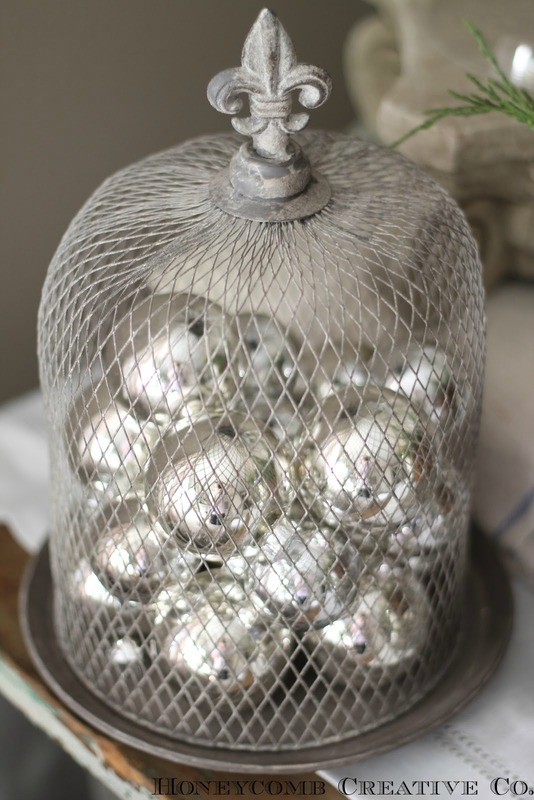 Lately, I’ve been admiring the many beautiful cloches filled with Christmas cheer. Here is a peek at some of my favorites. The first from BHG is a beautiful outdoor display. A little elegance added to this rustic potting bench. 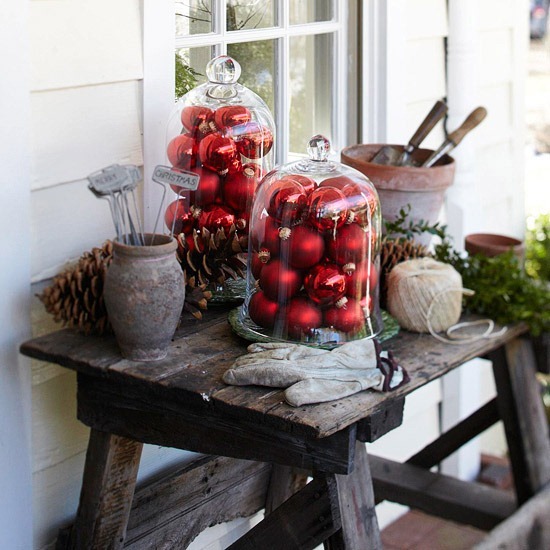 Here is another outdoor cloche idea from ClassicChicHome. What a wonderful way to light the path to your front door. 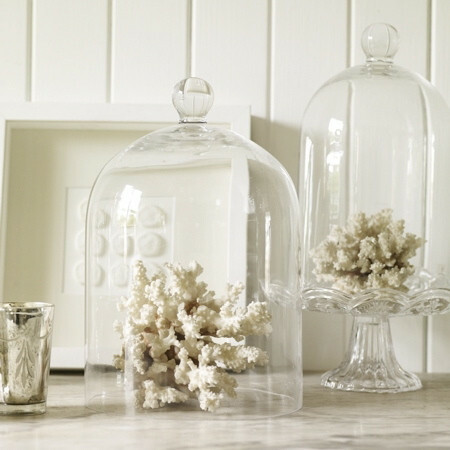 I was really drawn to these cloches because of their wintry white, coastal feel. 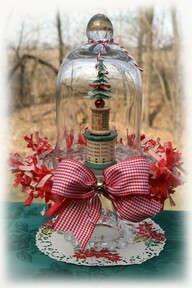 I think wire cloches are interesting and I love this one from Courtney at HoneycombCreativeCo. Head over to her blog for more pictures of her lovely Christmas decor, all done in silver and white. 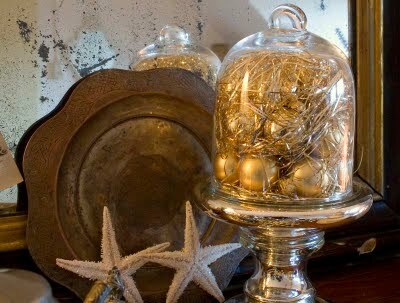 For more bling, look at this gold tinsel cloche on a silver stand from Marianne at Songbird. Her site is filled with pictures of her very vintage Christmas. The cutest cloche I’ve ever seen is at RhonnaDesigns. 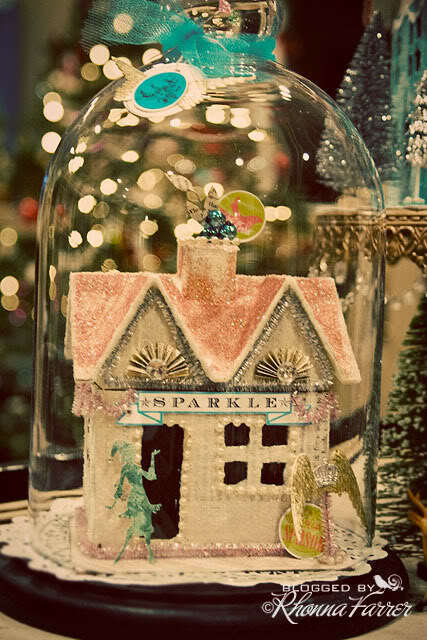 Pay a visit to her blog to see more of these glitter houses and a tutorial on how to create your own. Here is another from BHG, simple but fun don’t you think? 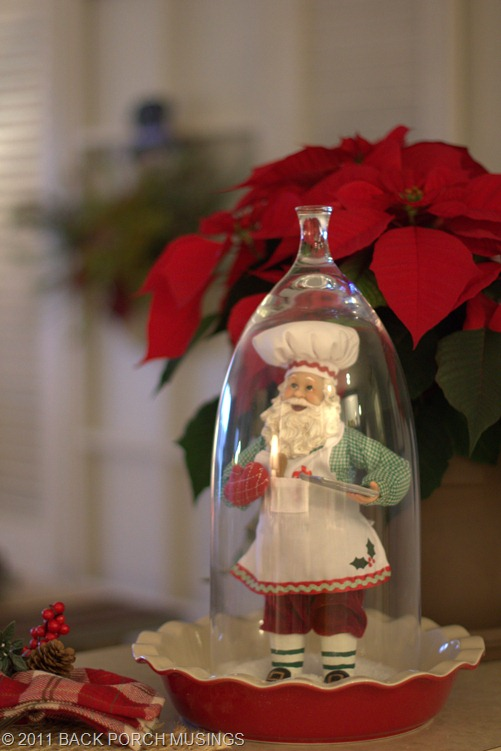 Take a look at this Santa under glass at Pat’s BackPorchMusings blog. I think he is just darling! While you’re there take a peek at even more of her lakeside cottage decor. This little cloche delighted me and the directions for putting it together can be found at VintageStreetMarket. This website is filled with lovely vintage papers for wrapping or scrap booking and is a nice place to revel in a bit of nostalgia. 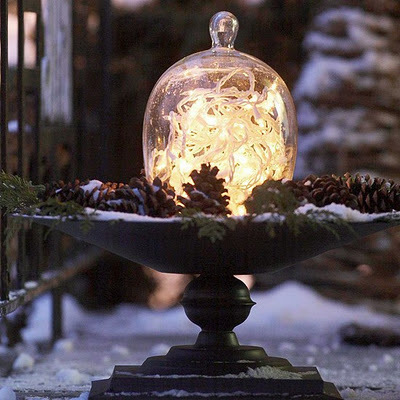 I absolutely love the elegance of this cut crystal cloche from Cindy’s MyRomanticHome. Crystal, pearls and silver, oh my! A visit to her holiday home is a must! 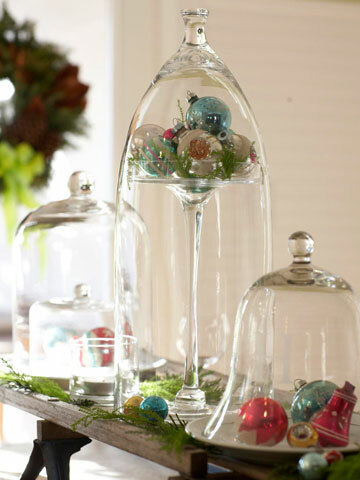 Can you believe how beautiful this cloche filled with pastel ornaments is? This display was put together by TheAtticGirls. They sell “modern vintage” items on Coronado Island in California. Road trip anyone? 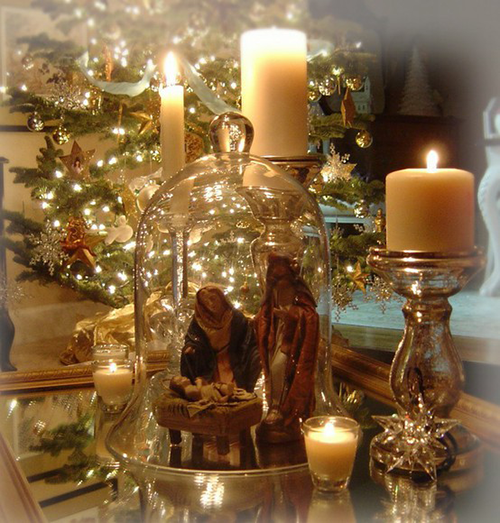 I couldn’t do this post without including a picture of this beautiful Nativity cloche since that is our reason to celebrate Christmas. And finally, I’ll share my very simple Christmas cloche with you. My mom was a proud Finnish lady, so it was a delight to receive this little guy to add to my Santa collection. Here he is, frolicking in his dome-covered woods of Finland! I came over from Mod Mix Monday, and love this post…I am finding these cloches are not easy to find, I always have my eyes open to find them at thrift stores. I like your Finnish one best..my mom and sister and I were in Finland about 15 years ago. 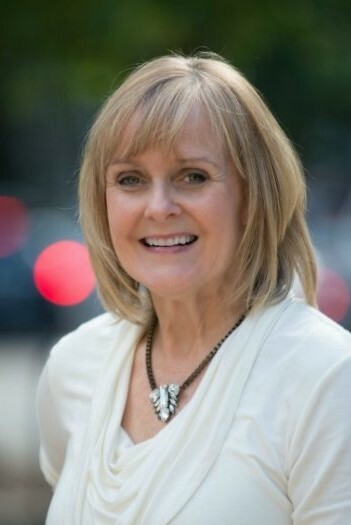 I read your profile, and love your “restoration mission”..I am your newest follower! Finland myself but my daughters keep saying we need to go find our long lost relatives! Thanks for sharing the wonderful cloche ideas. I have one for Christmas that I need to post. So many wonderful ideas~ thank you for sharing. May the peace, joy and love of the season be yours all year long! I love a good cloche! Thank you for having the party Marty!